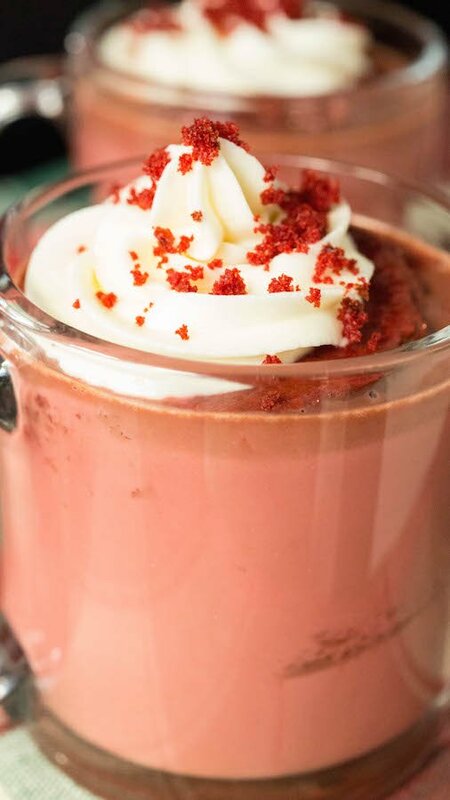 I’ve seen several red velvet hot chocolate recipes pop up recently. As a girl raised in the South, I absolutely loved the idea! There was, however, one problem…where’s the cake?!? Not a single one of these recipes involved any actual red velvet cake! I’ve decided to fix that and bring you the most decadent, delicious red velvet hot chocolate recipe there is! It’s really easy too. I opted to go with a box mix cake to keep it simple. If you have a great recipe for red velvet cake and want to make that instead, more power to you! If I were home I would’ve made my mom make hers. She makes one of the best red velvet cakes I’ve ever had. On top of the red velvet cake, I piped some easy to make cream cheese whipped cream. Then sprinkled some crumbled red velvet cake on top. Nothing wrong with a little cake on cake action, if you ask me. This was my first time making a cream cheese version of whipped cream. Damn. I have been missing out! This stuff was A-MAZING! I recommend putting it on everything. Honestly, we thought this hot chocolate is one of the best recipes on our blog. I love having the actual piece of cake in there soaking up the hot chocolate. I ate it with a spoon and savored every single bite. We found that this red velvet hot chocolate pairs quite beautifully with classic sugar cookies, a fireplace, and a few Christmas movies. Here’s to drinking alllll the calories before the New Year! Make the Red Velvet Cake Mix according to box instructions. Place whole milk in a pot over medium-high heat. Add the sugar and stir until dissolved. Add the semi-sweet chocolate chips and stir until melted. Add red velvet emulsion and vanilla. Stir to combine. Remove from heat. Use a hand mixer or stand mixer to cream the sugar and heavy whipping cream together for 3-5 minutes, until soft peaks form. Add the cream cheese and mix until combined. To assemble hot chocolate, use a biscuit cutter to cut out a piece of red velvet cake. 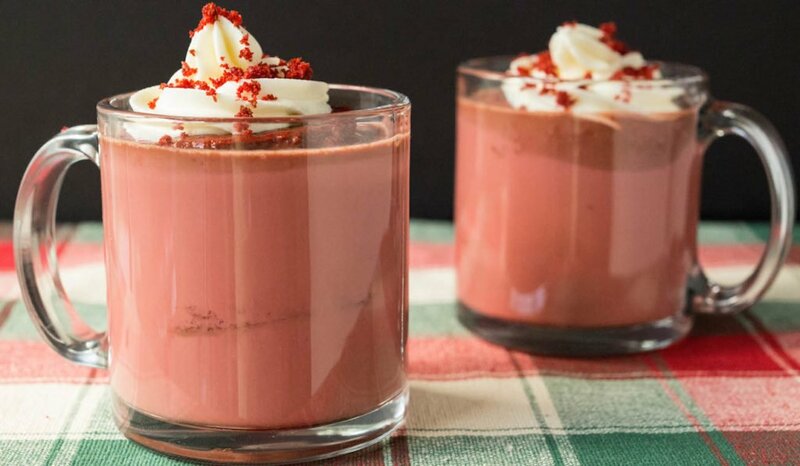 Place in a glass, then pour the hot chocolate over the top. Next either pipe or dollop the cream cheese whipped cream on top. Sprinkle on some crumbled red velvet cake. Serve immediately. 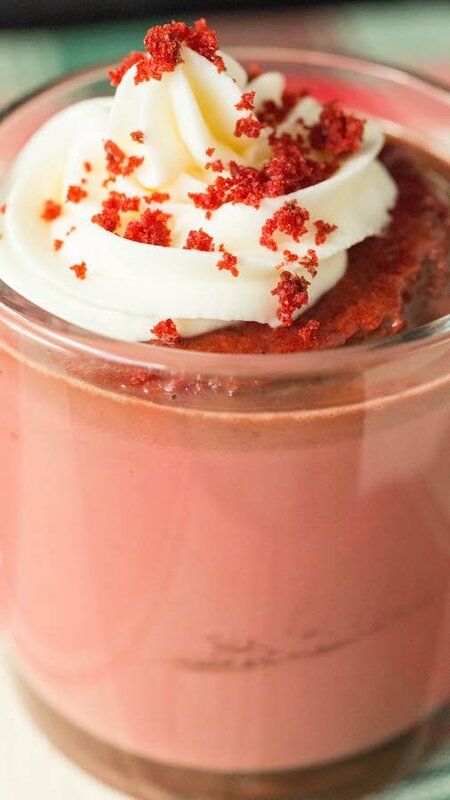 Okay, how genius is it to put actual cake in your red velvet hot chocolate? I LOVE this idea!